Did you know that all Bourbon is whiskey, but not all whiskey is Bourbon? What?? Can you run that by me again, please? Bourbon is a uniquely American word and product and is officially labeled as Bourbon Whiskey. But what makes Bourbon, well...Bourbon? And how does it differ from other types of whiskey? There are two main criteria. First, Bourbon must be made from at least 51% corn, whereas whiskey in general can be made from any type of grain...rye, corn, wheat, millet. If it's made from grain, you can call it whiskey. But if you want to call it Bourbon, your mash must be at least 51% corn. The second criteria is how it is aged. All Bourbon must be aged in a NEW oak barrel, whereas a general whiskey product can be aged in a new or used barrel. There is no time requirement for the aging of Bourbon, just that the aging occurs in a brand new barrel. So how do you turn corn into Bourbon? That's a great question. Magic! Just kidding. It's actually science and begins with the oh-so-scientific processes of liquefaction and saccharification. These are fancy terms that mean taking a complex carbohydrate...in this case starch...and converting it into its monosaccharide components, basically sugar. These steps are required when making spirits like Bourbon, but not when making wine. Any why is this? Because the raw materials used in wine making...grapes...have sugar readily available to use for fermentation, which is the conversion of sugar into ethanol. To conduct a grain fermentation, we must first "crack" the starch to get at the sugar. So how do we crack the starch? First we mill the raw grain, which we do right here in the distillery with a machine called a hammermill. Once we have milled grain, which has a flour-like consistency, we add it to heated water to produce the mash. This step is the liquefaction and is conducted at a precise temperature and pH with the addition of certain enzymes. Once liquefaction is complete, the saccharification process begins by way of different enzymes added to the mash at a (different) precise temperature and pH. Now we have sugar available, which we can ferment into ethanol by the addition of yeast. Wow...that's a whole lot of science! 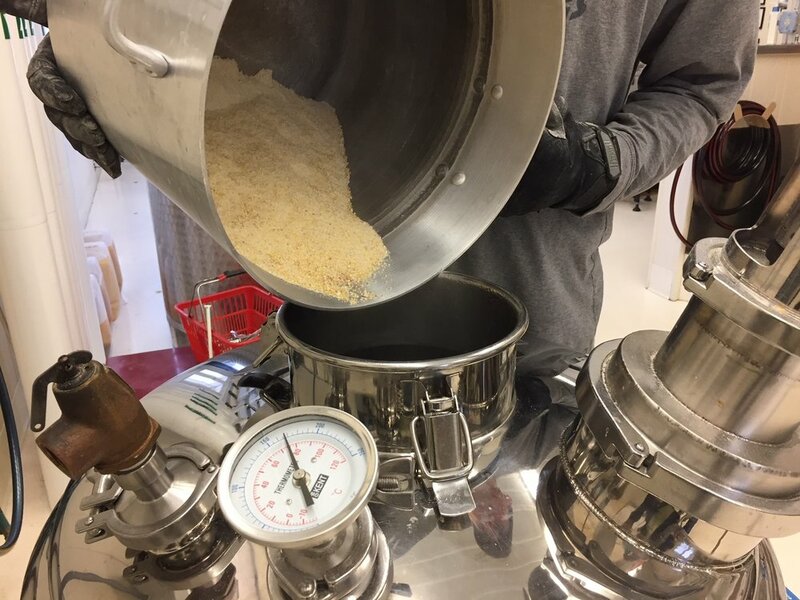 Once the yeast has been added, our grain mash will ferment away for five or six days, producing a low level of ethanol. But don't spirits have a high level of ethanol? Indeed they do. We'll talk about that next week when our fermentation is complete, and our Bourbon mash enters the process of distillation. Do stay tuned!